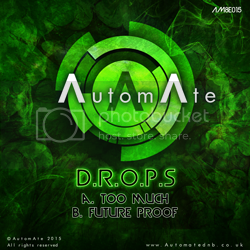 UK based collective D.R.O.P.S made their AutomAte debut on the Depth of Vision EP Volumes 1 & 2 with a pair of laid-back rollers. Rising through the ranks, they follow up here with a solo single aimed square at the dancefloor. Too Much is one of those core, quintessential things that every DnB DJ needs in their arsenal – a dirty roller! A relentlessly pulsing, throbbing bassline driven by a weighty, running drum beat, simply designed to shift the dance up a gear. Why won’t my damn feet stay still? Future Proof is a slightly creepier affair, rolling and stepping in equal measure with a robotic, futuristic vibe. Weighty core elements combine with skittish, shuffling metalwork that fades in and out of focus as we carefully tread our path through this unfamiliar land of cold-hearted machines.